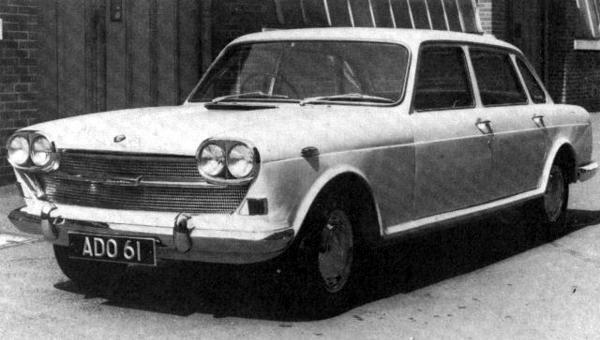 The Austin 3-Litre had a short life and certainly fell short of the expectations of its makers in terms of sales. Predicted sales of 10000 cars a year were maybe optimistic in an era where large cars were in an era of decline; the 3-Litre was to replace the much loved Austin Westminster but also had to fit in with the rest of the range of other cars in the BL family. This pretty much guaranteed a hydrolastic suspension set up would be required. The idea of the car was first discussed in the early sixties, the original concept was a collaboration with Rolls Royce and to use the Rolls Royce FB40 engine, with an enlarged Austin 1800 body shell, the car was to be marketed as either a Rolls Royce Rangoon or a Bentley Bengal. 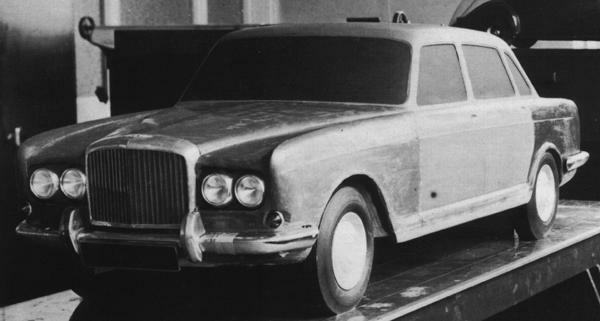 This project got as far as half size clay models as pictured below, before being abandoned, Rolls Royce then went off and built the Silver Shadow. The attention then moved towards the Princess 4-Litre R. The 4-Litre R was a car which was hastily developed and consequently had many issues upon its launch. For this reason the Austin 3-Litre was to be given a different approach before being offered on sale to the public. 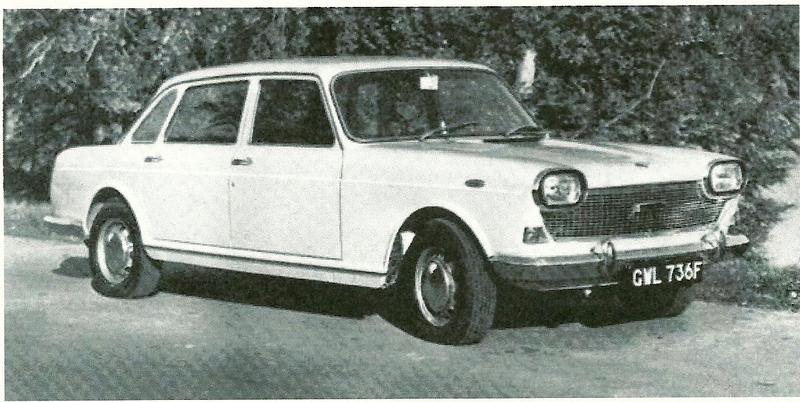 The first car was built in 1963 and was given the factory code of ADO61. Development was slow, the BMC and Leyland merger, internal politics and the rising costs of developing the car, coupled with getting the hydrolastic suspension to work on a car so large, all slowed its progress. One of the first prototypes is pictured at the top of this page. Twenty five cars were built and given to selected people for evaluation and testing, the feedback from these people instigated changes to the car before the true production cars were built, these cars had the now famous rectangular headlamps fitted. As shown in the photograph below. The first production car chassis number is 101. 9992 cars were built, the last chassis number is 10092. Raymond Baxter was brought in to launch the car but when it was unveiled it was obvious that the press were not enthusiastic about the car. 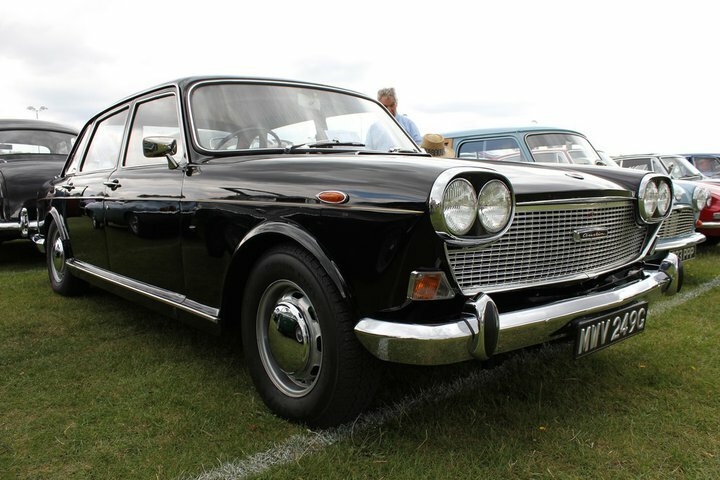 Priced at £1418, the first cars which are now known as "pre-deluxe" started to come off the production line in January 1968, this was almost a year after the car was announced, this version is pictured below. A total of 962 of this version were built, the car pictured below is the only road worthy survivor. Sales were slow and in an effort to boost sales the car was revamped in October of 1968, this is the "deluxe" version, and is pictured below. Revisions were; scrunchie door pockets instead of hard pockets, a larger steering wheel, cloth headlining replaced the previous vinyl, larger more comfortable seats with armrests finished in ICI Ambler replaced the leather seats, more luxurious carpets, higher final drive gearing, solid road wheels replaced the previous vented type and the chrome hubcaps were replaced by stainless steel items, front quarter lights and larger wood door cappings all gave a more upmarket feel to the car. The deluxe car essentially remained unaltered during its production run, towards the end of production the car had some slight revisions, the last few hundred cars built had engines which were upgraded to MGC specification which gave them an extra 15bhp, the engine in these cars is painted black, larger heater vents on the dashboard, a steering lock and improved front quarter light locks completed the facelift. April of 1971 saw the last car leave the production lines at Cowley. It was a well appointed luxury car, it was never replaced and is therefore the last big luxury car to wear the Austin badge, truly the end of an era. The car had some prejudices from its launch, some of these were due to its innovative design. People trust what they know and the 3-Litre had many new features not seen before in a car like this. Rack and pinion steering with load compensation sensing, hydrolic self levelling rear suspension, it was one of the first cars to be fitted with an alternator. All commonplace these days but in 1967 people looked at such things with caution. The author has spoken to some mechanics who worked on the cars when they came out and still shudder at the thought of working on one. This seems irrational really as the cars are relatively easy to work on, many people who run 3-Litres these days and do their own maintenance with no real problems. It was, and still is a great car, this has been proved over the passage of time, percentage wise it has survived in greater numbers than some of its contemporaries, given the desire for its component parts, this is a great achievement and proves its design was good. No derivatives were ever built by the factory, any variations on the cars were modified by specialist companies. A very capable car built slightly too late and into a declining marketplace, the 3-Litre was quietly dropped from the sales line up in 1971, a replacement was not considered necessary due to other in house models seen as filling the gap it left. BLMC Managers who ran them as company cars were in general very reluctant to give them up when the time came to change them. The last big luxury Austin was a very worthy car indeed and deserved a far better reputation than it had. According to figures obtained from the DVLA, 66 cars remain on their register, another 34 are currently known about overseas. One part of the cars history is banger racing, an unusual subject on a site about classic cars yes, but it is part of the cars history. These cars were very over-engineered and as such were incredibly strong, fast and reliable, this made them ideal cars for banger racing. Spedeworth drivers Nick Linfield won a world championship in 1981 driving an Austin 3 Litre, Graham Lashley followed suit in 1983 again in an Austin 3 Litre. 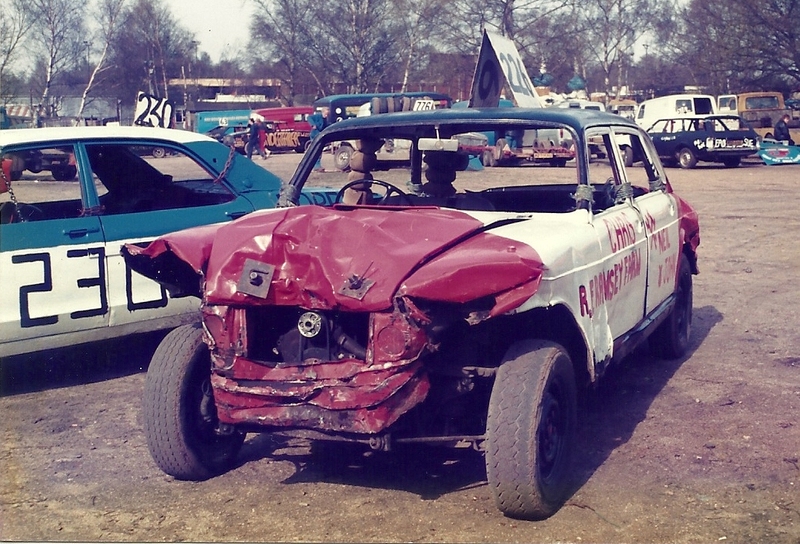 It is true that Banger racing has seen the end of many Austin 3-Litres, we would hope the vast majority of these were well past any hope of realistic restoration. MGC owners have plundered far better cars in search of a cheap engine or overdrive gearbox. In the 1980's many of these cars were beginning to show their age and due to at the time having low economic value, they made an ideal car for racing. The car soon became the choice for many seasoned racers, and feared by those who were racing other cars. It was very common to see the front of the engine poking out of the car and emitting a large shower of sparks as it made contact with its victim! The racing scene has always had racers sympathetic to the cars they race, and as such many cars have been kept on the road using spares from raced cars. The car pictured below, although looking sound was incredibly corroded underneath, several cars benefited from parts donated from it, some of these are still on the authors car over 25 years later! What goes round comes round as they say, a good many keen racers from days gone by are now passionately involved in preserving the cars that remain, one of them is the owner and author of this site. The only 3-Litre I have sent to this fate is the one pictured here, it was raced by a friend in 1988. The information contained on this site has been collated from a variety of sources, records in times gone by were not as accurate as they are in todays world, some of the information contained here is from the memories of those who were there at the time. I apologise in advance if there any inaccuracies, if you spot any errors please inform the author, contact details are on the contacts page.